Pete Walton shares his awesome H.O. 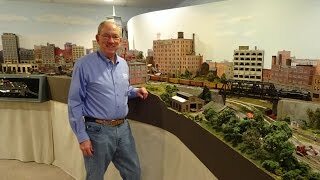 Scale / Gauge Model Railroad train layout he calls “The Great Midwestern Railroad”. Pete’s built several layouts and had to take them down, however when he moved in this house in 2002, he made sure the house would have room for his passion, the trains. This layout designed to look like the 1950’s, which includes a farm scene, a city environment, bridges, mountains, and a Paddle Boat in the water!